Going on a low-carb diet can greatly limit the type and amount of foods you can eat, but this doesn't necessarily mean that you'll need to give up yogurt. If you choose a version of the low-carb diet with an induction phase, you may have to wait until the next phase, however, to get your yogurt fix. Some induction phases limit you to no more than 20 grams of carbs a day, while other phases often allow anywhere from 60 to 90 grams of carbs per day. Some yogurts are lower in carbohydrates than others so make sure to check the nutrition facts label and the portion size to choose one that works. When trying to limit carbohydrates, you may want to choose whole milk yogurt over low-fat or fat-free versions. That's because the fat in these yogurts is often replaced with sugar, which is a carbohydrate. The sugar helps make up for the flavor that is lost when the fat is removed. 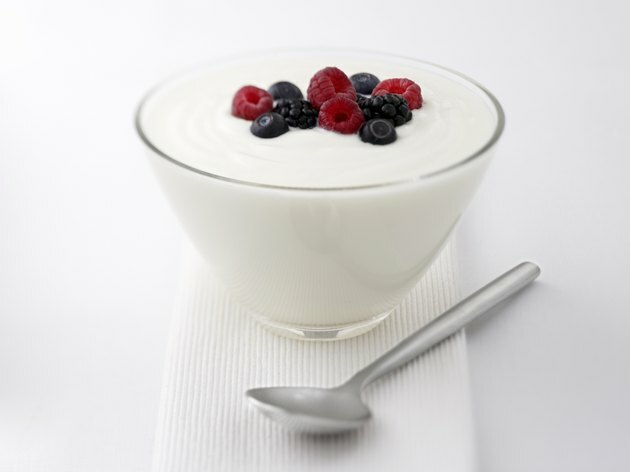 For example, plain whole yogurt has just 8 grams of carbs per 6-ounce serving, but plain nonfat yogurt has about 13 grams of carbs per 6-ounce serving; plain low-fat yogurt has about 12 grams of carbs for the same serving size. When companies add flavors to yogurt, they also increase the sugar, and thus the carb content, of the yogurt. A 6-ounce serving of low-fat fruit yogurt has more than 32 grams of carbs, and even the vanilla-flavored varieties of low-fat yogurt have more than 23 grams of carbs. Choose nonfat varieties and the carb content increases even further, with a 6-ounce serving of chocolate yogurt providing 40 grams of carbohydrates. All of these yogurt options provide more than the number of carbs you're allowed for a whole day in the induction phase of some low-carb diets. Because of the way that Greek yogurt is produced, it has higher amounts of protein and lower amounts of carbohydrates than regular yogurt. Much of the carbohydrate content of regular yogurt is found in the whey, which is drained to make the thicker Greek yogurt. This means that Greek yogurt is easier to fit into a low-carb diet, and you can choose one of the lower-fat options to help control your overall fat intake while still limiting your carb intake. A 6-ounce serving of plain nonfat Greek yogurt has just 6 grams of carbs. Some low-carb diets require you to count net carbs instead of total carbs. This is done by subtracting the amount of fiber and any sugar alcohols the product contains from the total carbs in a serving of the food. If you're eating plain yogurt, the net carbs will be similar to the total carbs, as yogurt isn't a significant source of fiber unless the manufacturer adds it during processing. The small amount of fiber found in fruit-flavored yogurts doesn't offset the large number of additional grams of carbohydrate found in them compared to plain yogurt. Not everyone loves the taste of plain yogurt. You can make it tastier while still limiting the number of carbohydrates it contains by adding a small amount of chopped nuts or a small serving of one of the fruits that are lower in carbs. For example, an ounce of dry roasted pecans only has about 4 grams of carbs, and the same amount of hazelnuts, walnuts or pine nuts will only add 5 grams of carbs. Mixing 1/4 cup of strawberries, blackberries, raspberries or chopped apple into your yogurt will only add 3 to 4 grams of carbs. Even with these additions, your yogurt will still have fewer carbs than pre-flavored varieties. Some people on a low-carb diet experience side effects, including headaches, constipation, trouble sleeping, nausea, bad breath or dizziness. The recommended minimum carbohydrate intake for adults is 135 grams per day, which is still relatively low. If you experience adverse effects from sticking to the lower amount of carbohydrates recommended on your diet, try increasing them to this amount to see if symptoms improve. Get these additional carbs from whole, unrefined foods, such as whole grains, fruits or vegetables, instead of from processed foods or foods containing added sugars. While following your low-carb diet, try to limit fat intake to the recommended 35 percent of calories and saturated fat, the most common type in yogurt, to no more than 10 percent of calories. Each serving of whole plain yogurt has almost 6 grams of fat, meaning that about half of the calories in the yogurt come from fat. FamilyDoctor.org: Nutrition for Weight Loss: Is a Low-Carbohydrate Diet Right for Me? Can Yogurt Give You Diarrhea? Are Apples & Yogurt Healthy?